The Trust in Yellow office will be open from 7.00pm to 8.30pm on Thursday evening to allow fans to pay for their coach place to Tranmere Rovers. It would be appreciated if fans could pay in advance to help Sunday run more smoothly. Unfortunately we didn't receive enough bookings for a coach to Chester on Tuesday to make it viable so we will NOT be running one. Our apologies. However, we are very pleased to say that we have been able to obtain a third coach for Tranmere on Sunday. To enquire about the availability of places please text Bill Sloan on 07952 056385. To make the organisation easier no further online bookings will be taken. If you have booked on the coach but now find you cannot go please text Bill as soon as possible. 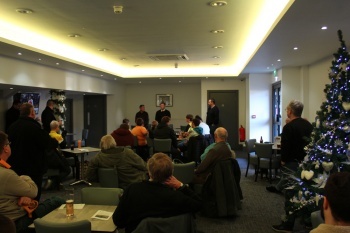 Ahead of the FA Trophy game against Chester, we held a question and answer session in the 1881 Lounge with manager Liam Watson and director Phil Hodgkinson. Thanks to Liam and Phil for giving their time to speak to supporters and to all the fans who attended. Our newsletter for November has been sent to members and is available to read HERE.